It is the scene of Nada Ward. 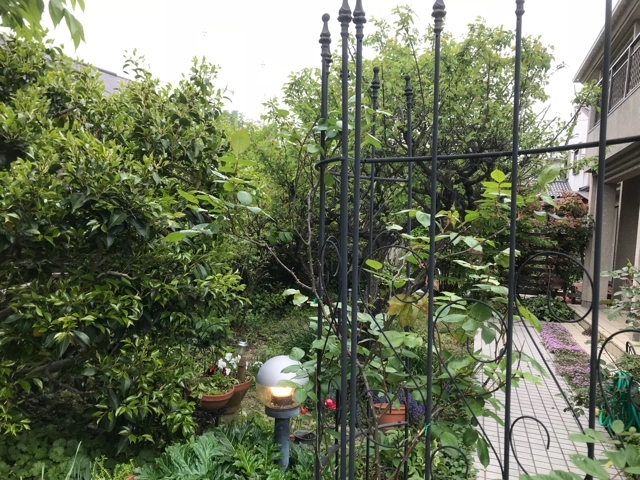 Small south garden. 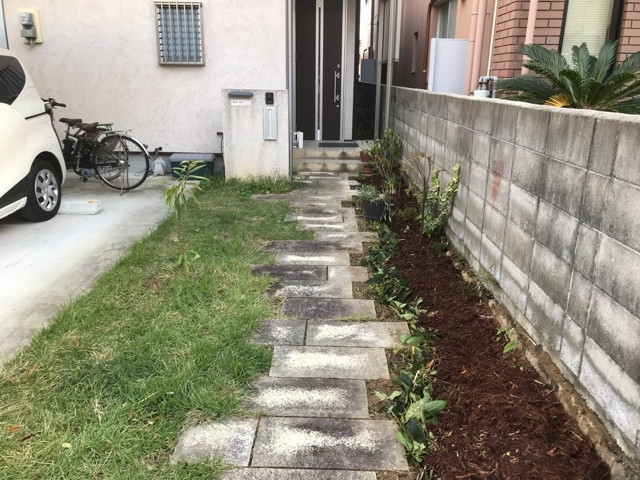 I will make a small family garden there. < > It is a nice feeling that plenty of grass grows. < > We will also remove such small items at once. 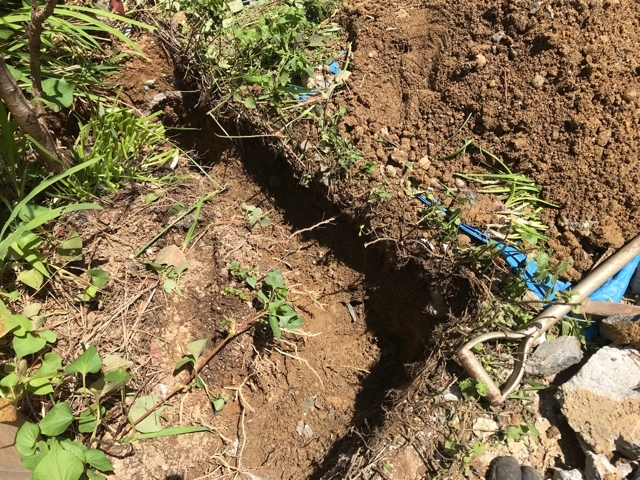 < > Ridge up and dig a groove and a vertical hole. < > Crescent shaped ridge. It is the root of the plum tree of "variety as it is". Ridges do not have to be straight. Or, I think that it is better not to be straight. 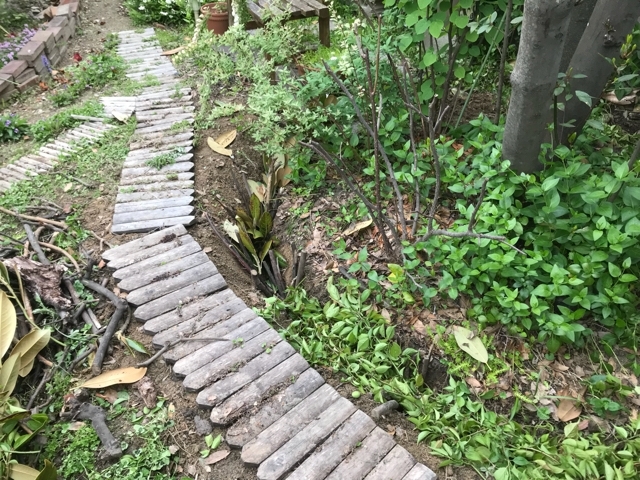 < > Like a floating island in the ocean, add a topographical drop to the garden and finish to maintain the topography with charcoal and branches. < > The south garden, it is completion. < > Then the orchard in the northern garden. 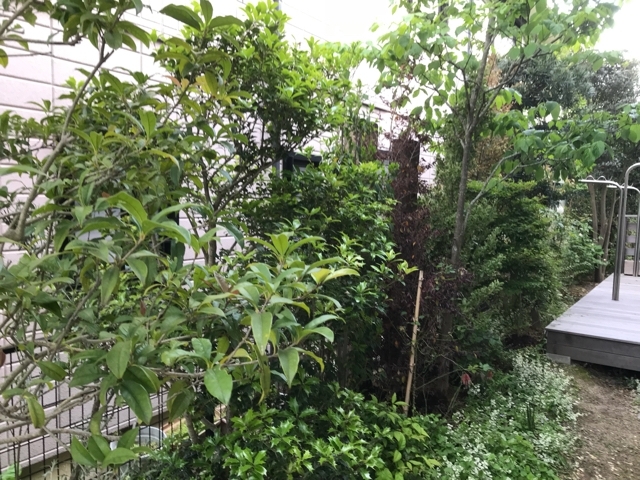 < > I will plant fruit trees in this slender planting area. < > Organization of existing plants. We make use of existing things and make base of planting area without changing environment as much as possible. Dig into the planting plant once and avoid it sideways. < > Create a topographic drop, put charcoal and branches. This time I planted chestnuts, plums, decorps, figs, cranberries. I think that it is a good choice. 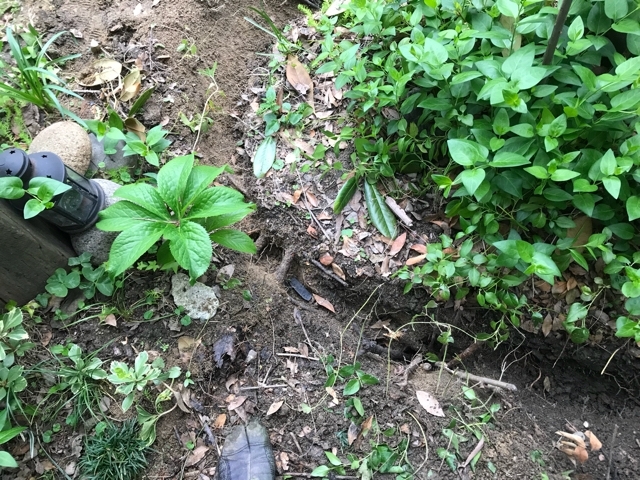 I planted Dekopon in the south garden. Because the harvest period is long, a lot of delicious oranges can be made. Chestnuts can also be staple food. I chose a variety called beauty that plums fruit alone. It has good leaf scent, fruit is delicious, strong and grows steadily. I am looking forward to the future hourly wage life. I think that you can expect a considerable harvest even in a small garden. 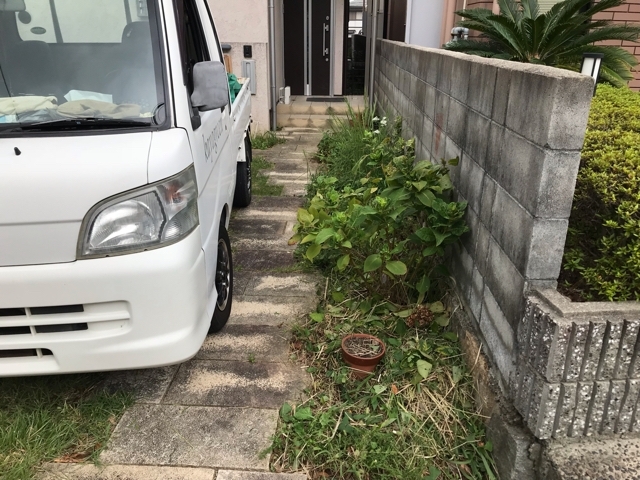 Even if the urban gardens are all like this, even if logistics stops due to a disaster, it will be helpful if you get food from your garden. Even if you do not buy food, you can pay hourly to a certain extent. 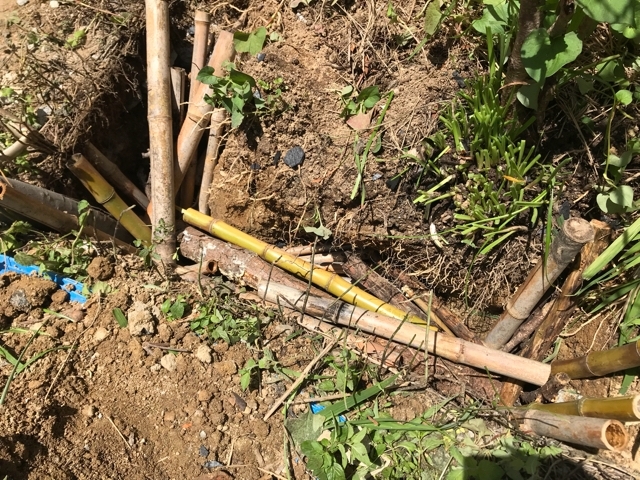 Fruit trees and vegetables grow anywhere with the ground. < > It is the scene of Nishinomiya city. 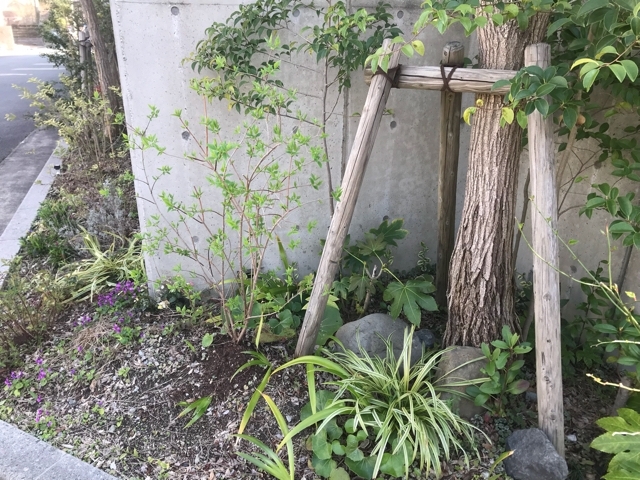 Nishinomiya Nation Salt has an old village, imagining whether there was a rich salt water source in the mountains but also natural rock salt from place name. It was a nice place for people to live, so nature and people would have created a village, cleared the mountain and converted it into a field. A newly-emerging residential area will be built where it was once a field away from the old village. The fields are built in places where the risk of disasters is small. < > I think human beings instinctively catch safe places. It seems that there are many places where the settlements are formed at the bedrock layer in the mountain village, and the salty was such a feeling. I guess people knew that rock beds would not move with rare things. < > The residential area that was formerly a field was obliged to secure a green space according to the policy of the city. It seems that it is obliged to leave green in the city as part of nature conservation. This time I asked for a new planting in the garden of a house built in such a city. Houses built surrounded by concrete retaining walls. 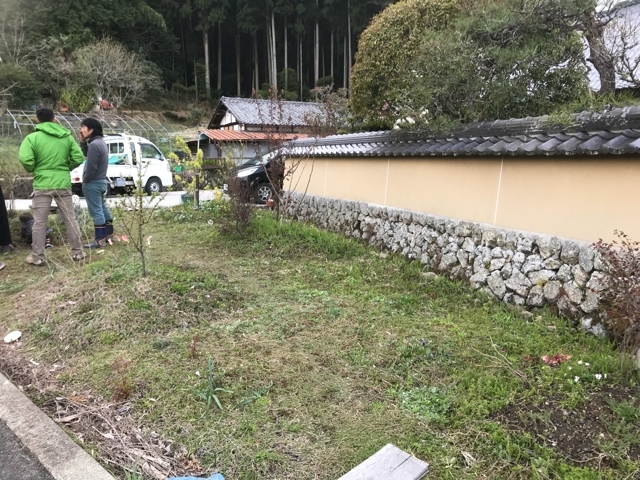 Since it is a sloping ground, it is necessary to make a retaining wall artificially to create a flat ground in order to create a flat space when making along a natural topography. 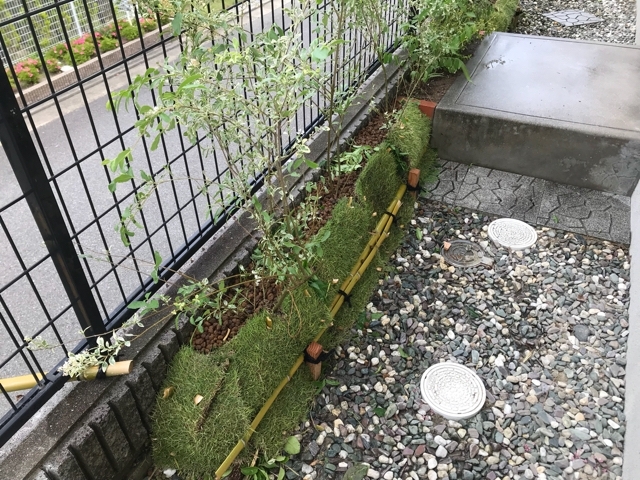 Concrete is a very convenient material, but as a problem, it is in the place where human beings shape it and want to do it, and form an artificial environment by cutting out nature. 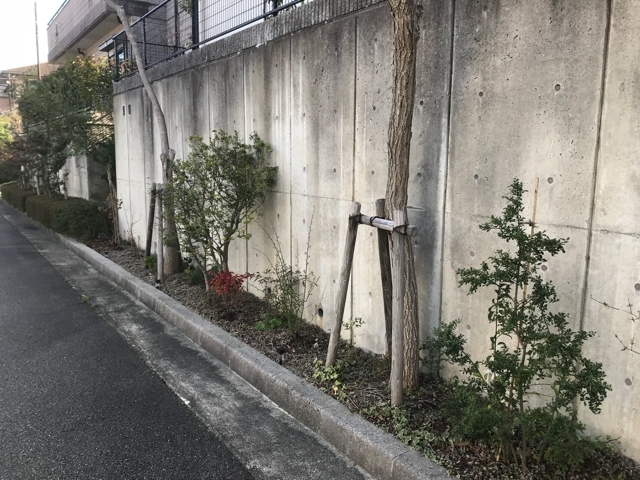 Most of the trees in the residential area that I made are painful, for example in the case of Kobe City. 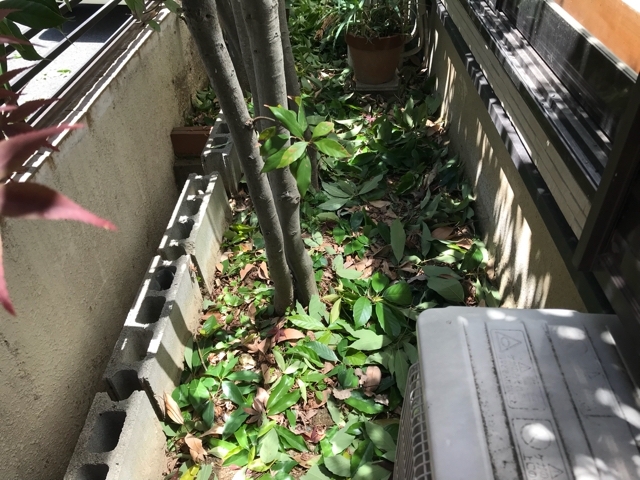 A large amount of pests occurred, the ecosystem is not functioning. In the case of salt water, it is originally a deep mountain topography. There is a deep valley, the river flows along it, maintaining a stable terrain. I feel that the newly created residential area is supplemented by its original topography. 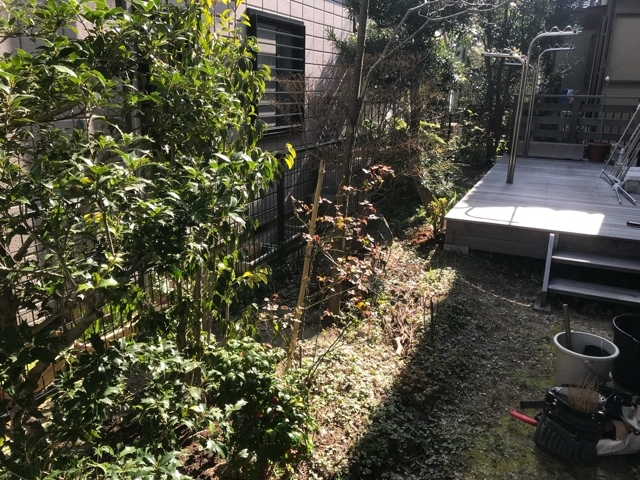 Even though concrete and asphalt are covering the ground surface by this amount, the trees in each garden are generally in good condition and the trees are relatively vigorous even in the garden built on the concrete retaining wall of 2 m in height. < > The topography drop and the stable rock formations support the lives of people. 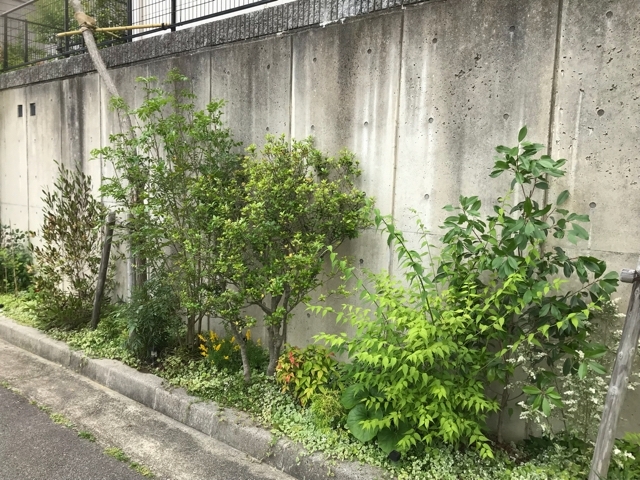 In the green space under the retaining wall, newly planted soyogo, simonnelico, benicakaname, pop push bullblair, hinoki, comfortumma etc. A delicate leaf tree that flares in the wind. The owner's request was such a feeling. 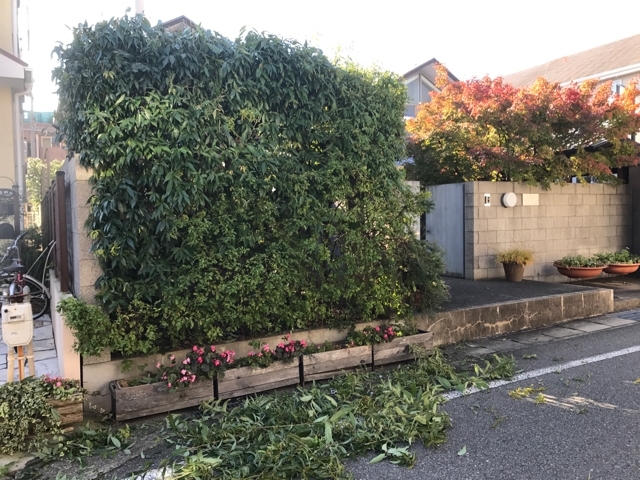 And there was a request that you want a blindfolded hedge in front of the garden part on that, in front of the doorstep of the east side. As a result of various considerations, the hedge's plants were determined as variegated pre-pets. Place to plant is a place putting soil on concrete and spreading gravel. 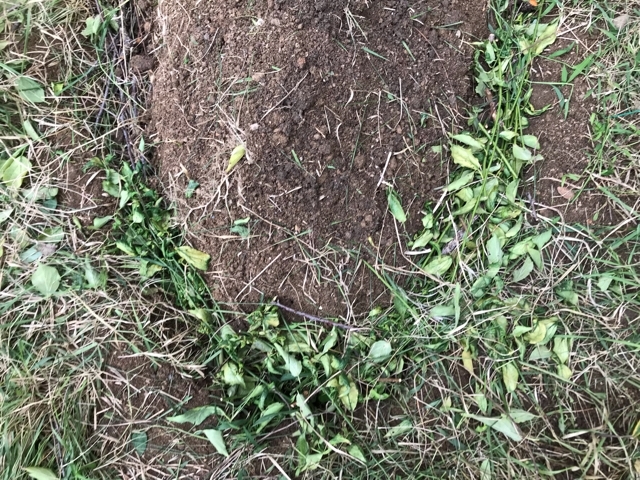 Gravel is spread over thin soil. 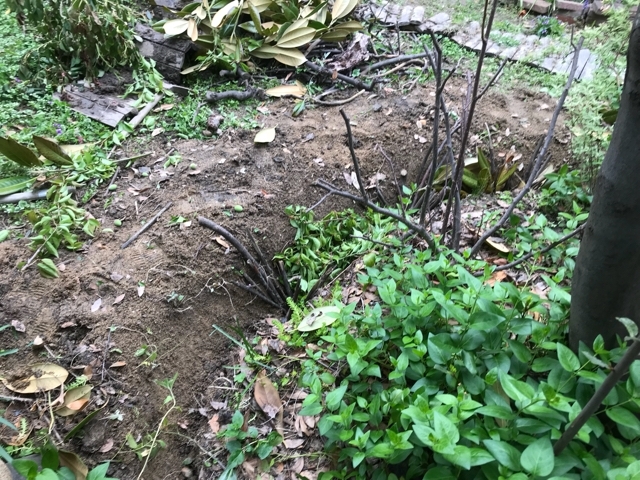 It is fashionable if you make a flower bed with bricks or blocks, but it is harsh for plants. The root of the plant is breathing. Instead of planting in an environment like a pool, we create a breathable environment and plant it there. "Create a long and square square moss ball that matches the space in a way to make a huge moss ball and plant it there. 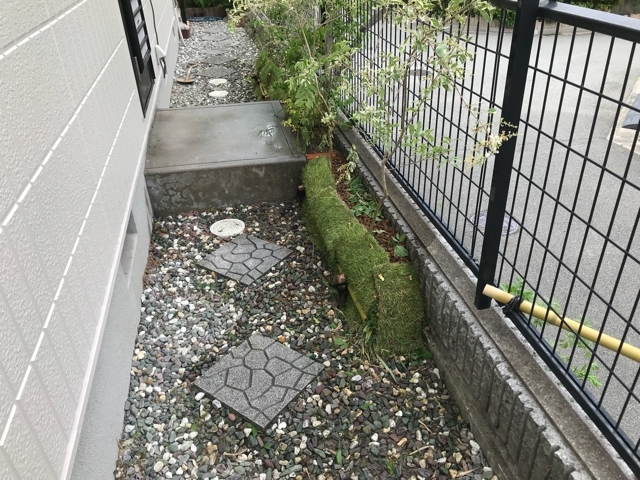 In this time I used Hime Takanori in place of moss. The lawn grows steadily and builds a rich greenery on the concrete ground if you put roots in gravel and let it go. 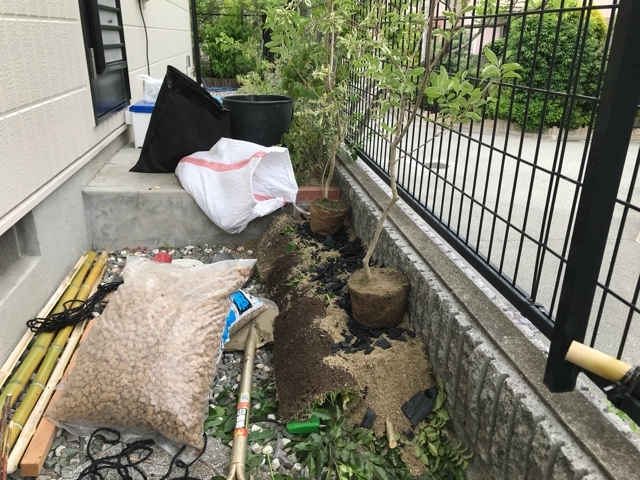 < > Put branches on the gravel, put charcoal and lay sand. Place the large grain of Akadama soil on it and plant the pre-pet there. 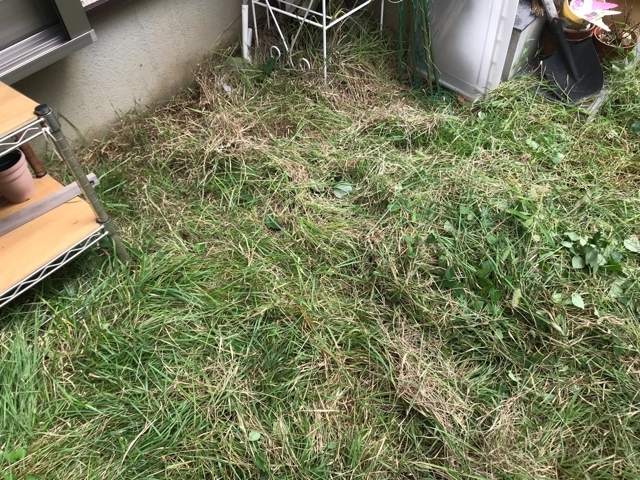 < > Both the pre-pet and the lawn planter were successfully revitalized. 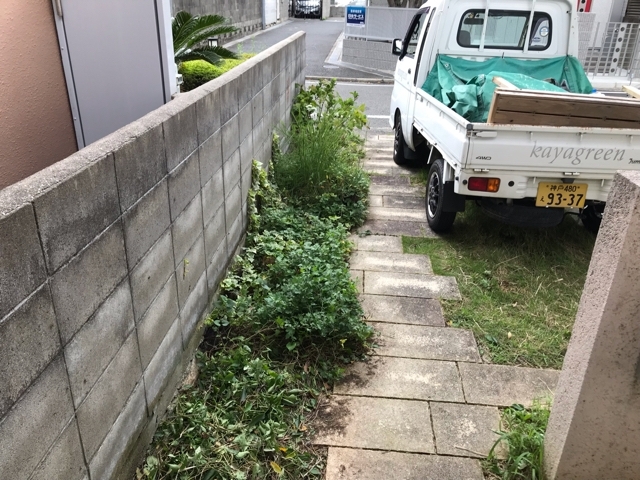 Blindfold hedge, I think that it grows up in good condition. It is the scene of Akashi-shi. 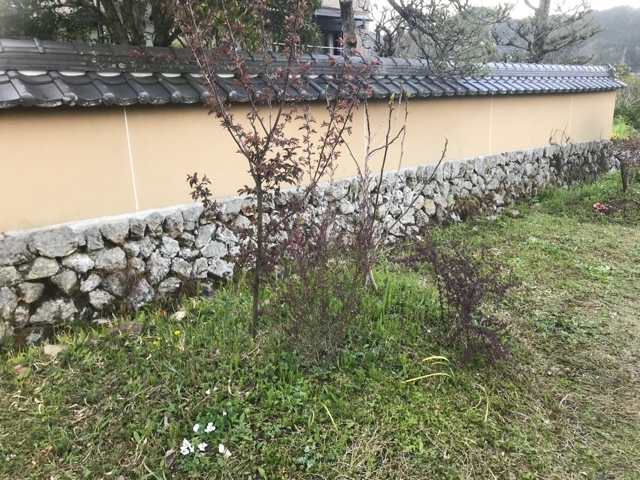 Although the peach tree is July, no leaves have appeared at all. 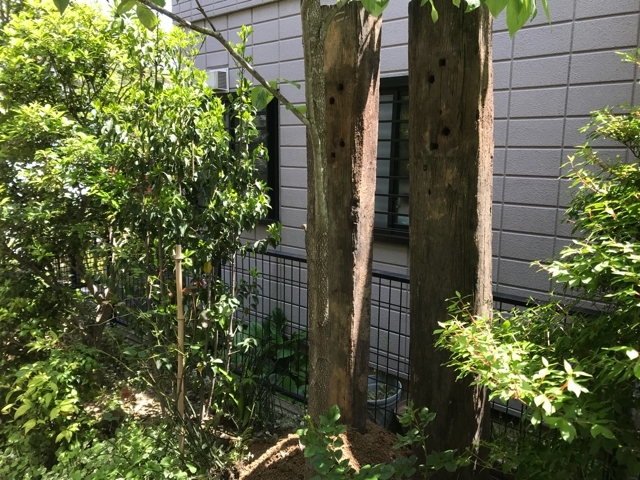 After receiving consultation, when I asked in the spring, I thought that sap had come out of the branches and thought that it was the moth larvae work, we suggested scattering wood vinegar vinegar. 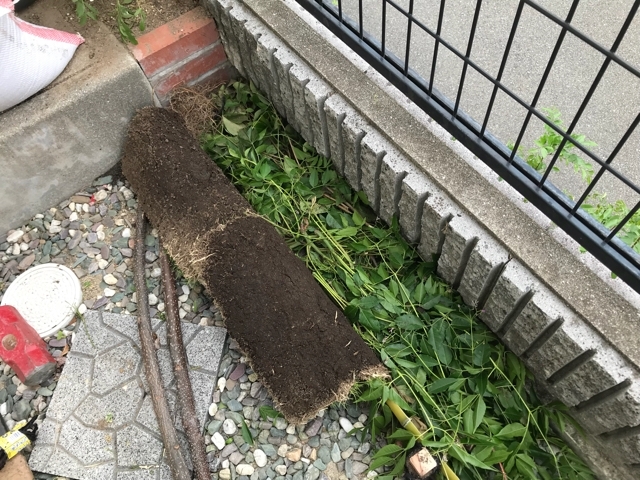 Still leaves did not come out, so I will check the state of the root. 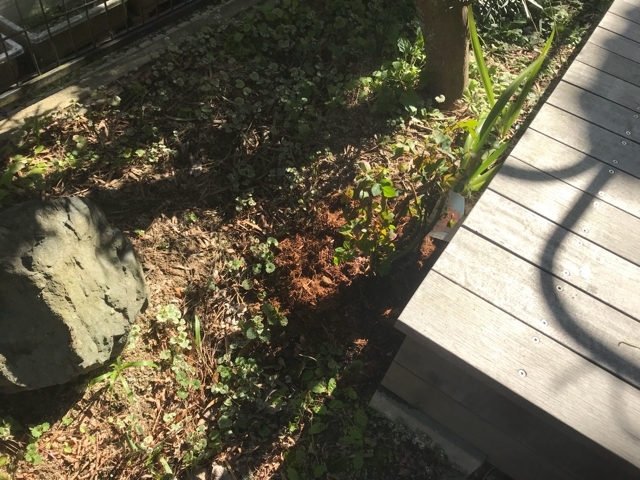 Remove pincolo stone consolidated by concrete in the planting space and insert char and branch there. 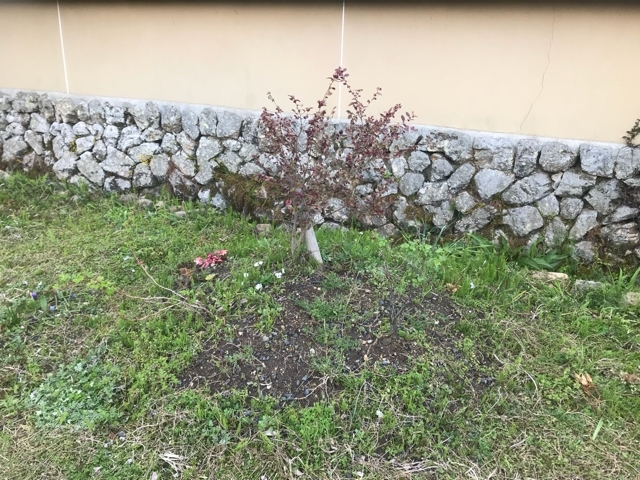 The pincolo stone was inserted in the depth of about 20 cm, and the root of the peach tree passed under it and extended to the side of the road. Below is a rooting that extends sideways without lowering the roots. < > It would be that this tree did not stretch the root judging that there is no root just below the root and no air below it. Pierce the root of the fist just under the root and insert charcoal and branch. < > Insert charcoal and branches back into place where pin-out is removed. < > This time I did not use a pipe pipe. Terrain head, charcoal and branches. I am currently looking for ways to improve this without using pipes. 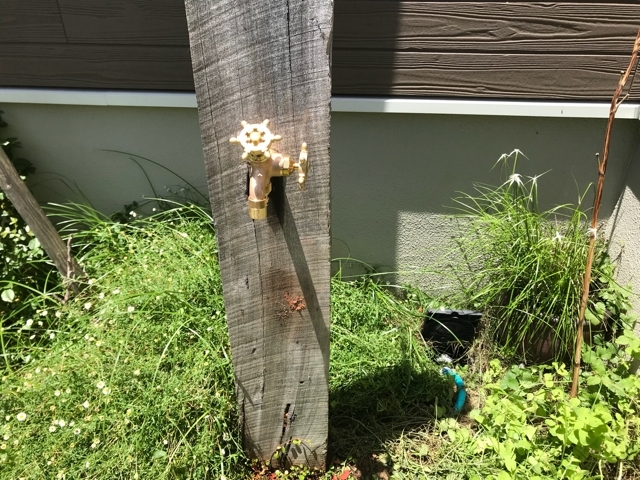 < > We installed a faucet of a tap. < > It looks very good with a sleeper. 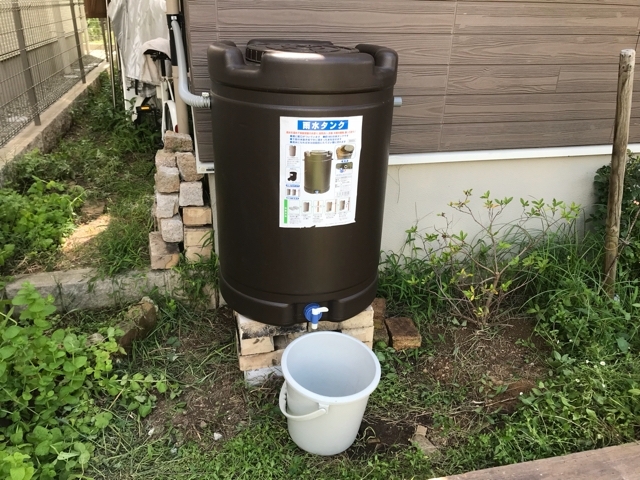 < > Then install the rainwater tank. I do not know when and what will happen to the environment. If there is heavy rain there is also drought. A rainwater tank that can store 180 liters of rain water. I think that this water can be used for various purposes when it is. 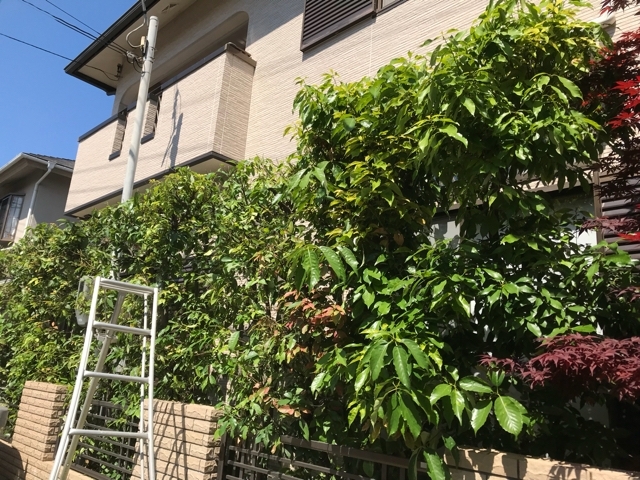 It is pruning of oak's hedge. 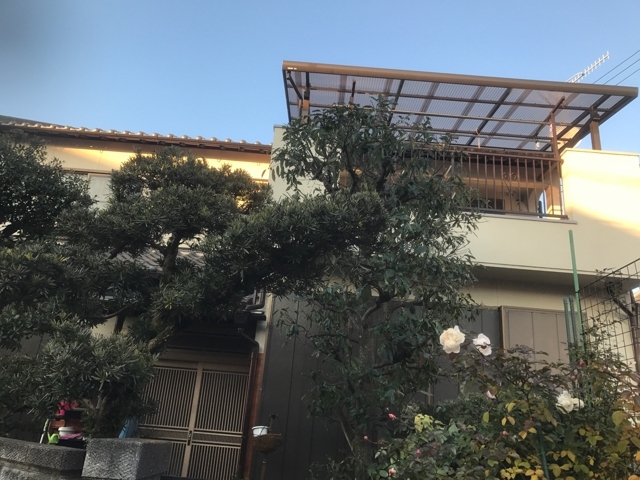 Half a year has passed since the last pruning pruning. Spring shoots came out and it was busy. Until then, I used pruned scissors in conjunction with Nokogama, but this time I made it with only Nokogama. < > This time we pruned by pruning with pruning and sawing. < > And the thing that I was most happy about was leaving the fallen leaves. 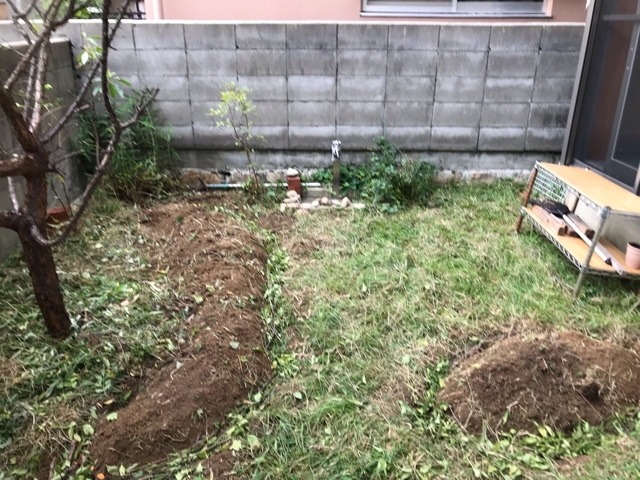 It has passed for about 5 years since the grandmother of the previous year passed away and the current wife was taken over from the management of the garden, but for the first time this time for the first time leave leaves at the root. Every time we saw the merit of leaving the fallen leaves at the root, I was telling you, but I could not get permission to leave the disadvantages such as flying by the wind and it is hard to leave, but even if I left it last time It turned out to be nice, and I thought about how I wondered. 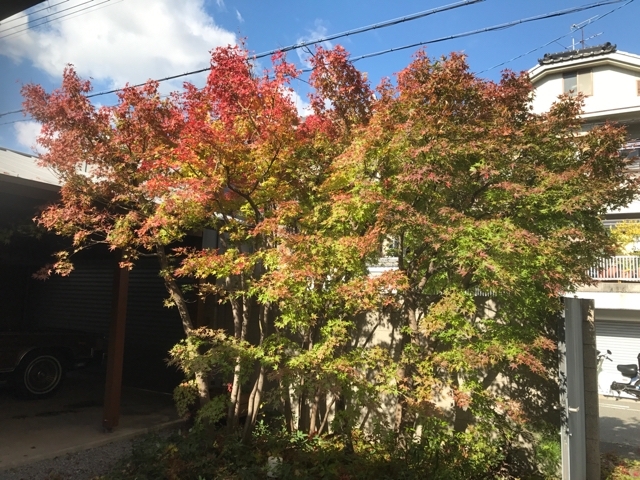 < > Green is the branches leaved this time and brown is the last branch / leaf. 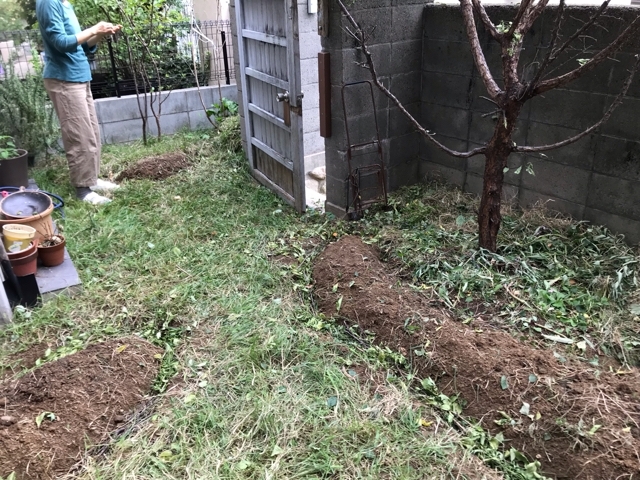 < > The smell of the soil was also changed. 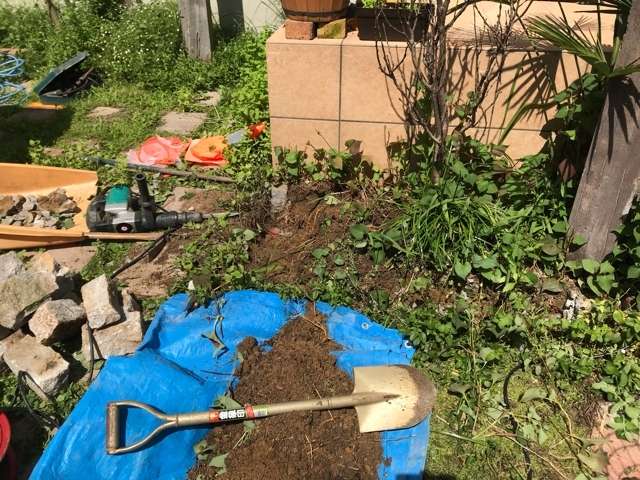 I did not excavate the soil, but when I started cleaning I had a sweet smell. It was the happiest thing in recent days. It is the scene of Nishinomiya city. 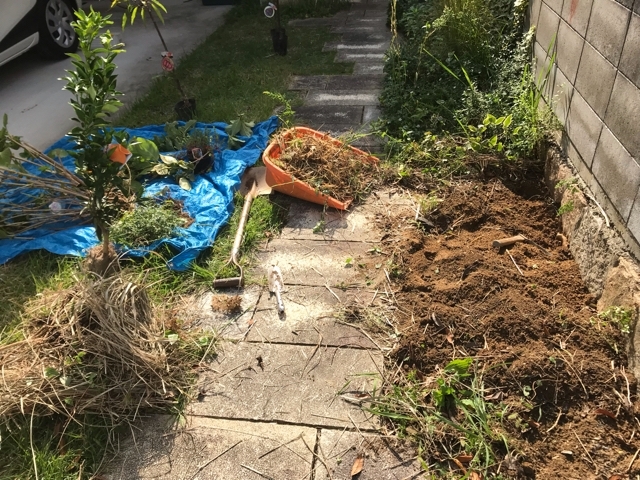 Combining sleepers and planting in blindfold with the neighbor, I planned to block the line of sight with the hardship. < > The sleepers are Eucalyptus from Europe. 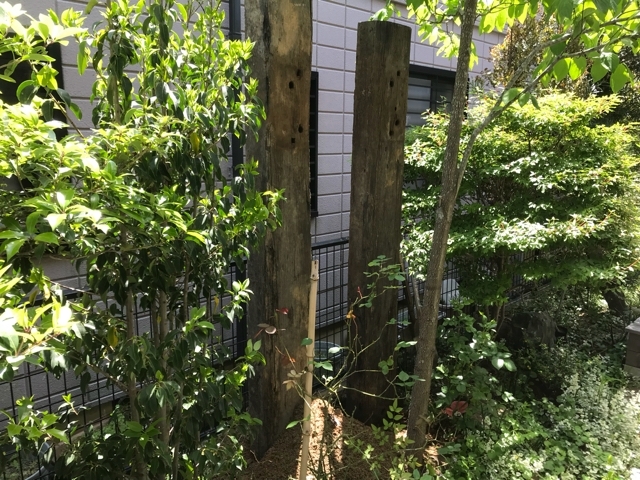 Domestically produced second-hand sleepers are using creosote agent, so we can not recommend it healthily, so we used imported items, but used second-hand European sleepers. The reason is that it is not newly harvested and that medicines already imported to Japan are only using insecticides at the time of import. Eucalyptus is that it is hard to decay as much as it is natural. 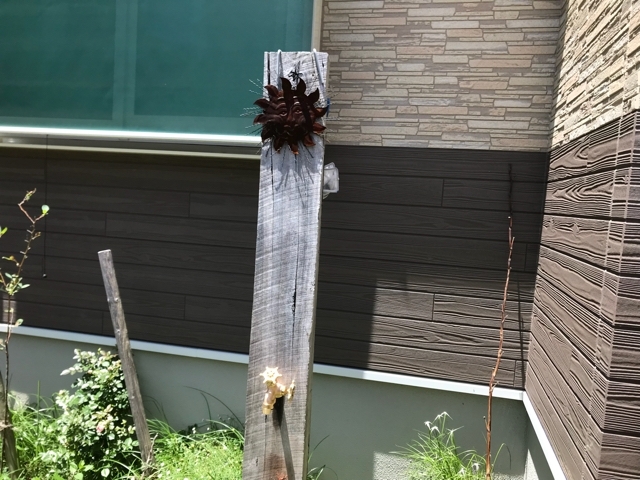 We examined new products such as domestic cedar materials and pine wood including safety, but this time it was selected as a result of trial and error of various matters such as durability and atmosphere. Where to compromise and where to give priority. 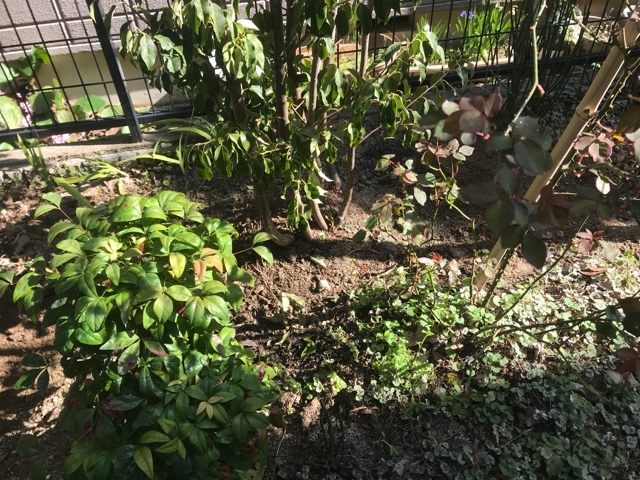 We also decide one plant at a time by rubbing the wishes of the owner and the recommendations of this place for the selection of plant of planting. It was a really good study this time. Although I would like to respond to requests as much as possible, it is the sensibility that I feel beautiful, such as the feeling that there is also fear in the way of feeling even with white flowers, for example. The owner is a professional musician and he is rather sharp in sensibility or his own view of the world is clear and it was very hard to understand its unique view of the world but it is fun and finished There are also parts I noticed. But I do not think I can understand it yet. 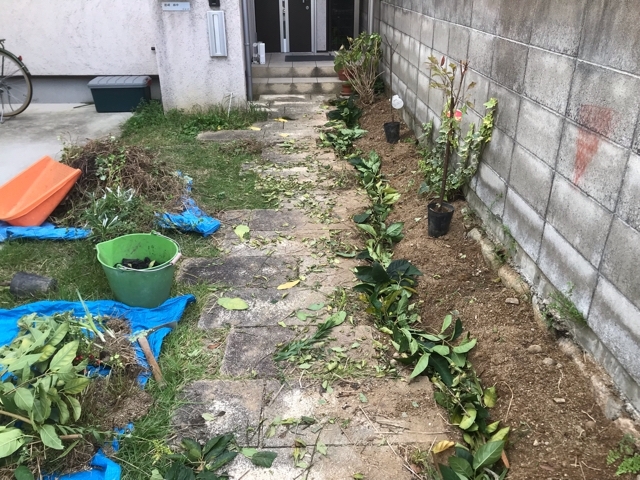 < > The final decisions at planting were gin masaki, red and white of Tokiwamansaku, variegated preppets, and a conostigma. 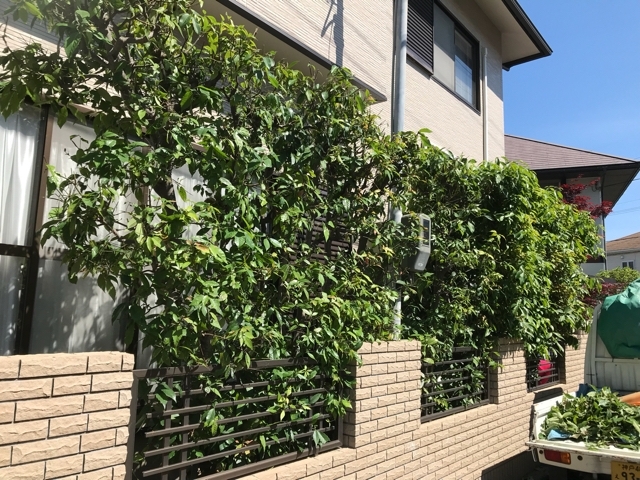 There were also conditions of the environment that it grows even on sunny days about half a day under conditions such as soft leaves, evergreen, not too big, western style. < > I like it but it is environmentally difficult or too big. 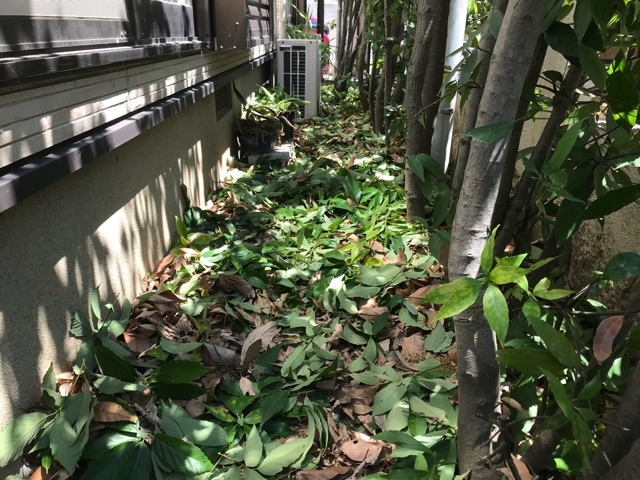 Although it is environmentally recommended, there are things such as the impression that it is firm for the owner, how you can tell and receive such things, things that you do not notice unless you do your word, and we will somehow receive it As the owner would like to tell somehow. There were also things that I could finally understand after explaining with words and expressions quite a bit. 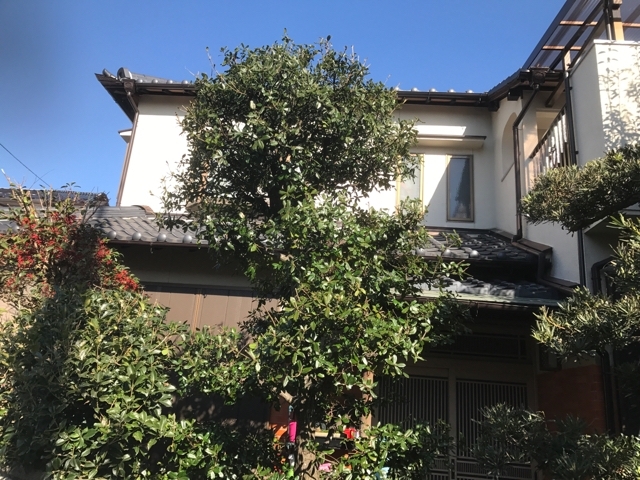 I can understand that there is such a way of feeling for the first time, as to explain the feeling of white flowers and the contrast between leaf color and flower color. If you explain it, you can quite empathize, or you will see something in the garden you want to aim. 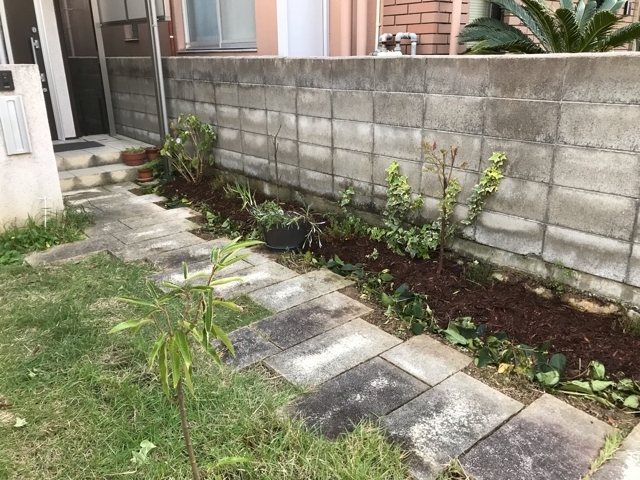 Creating a garden is also very interesting in that sense. Next time we have a planting selection for the planting section below. I would like to do my best to bring it closer to the owner's view of the world. It is the scene of Ikeda City. In the garden here before, we have done construction work to restore the circulation function as a whole. 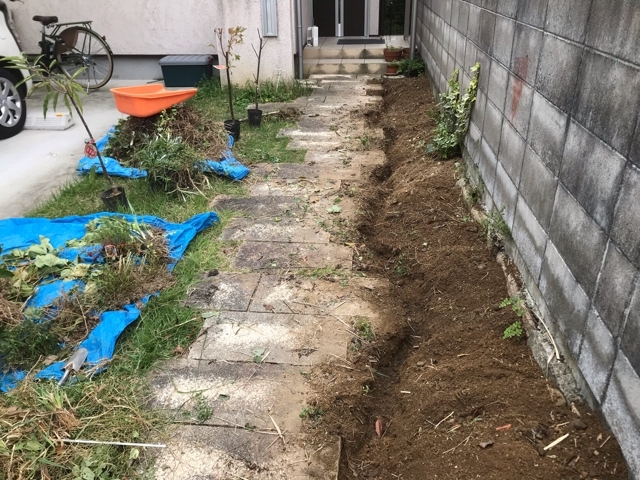 Then I was not able to visit maintenance so easily, the place where I built it buried in Oita soil and the permeability function was weakened. 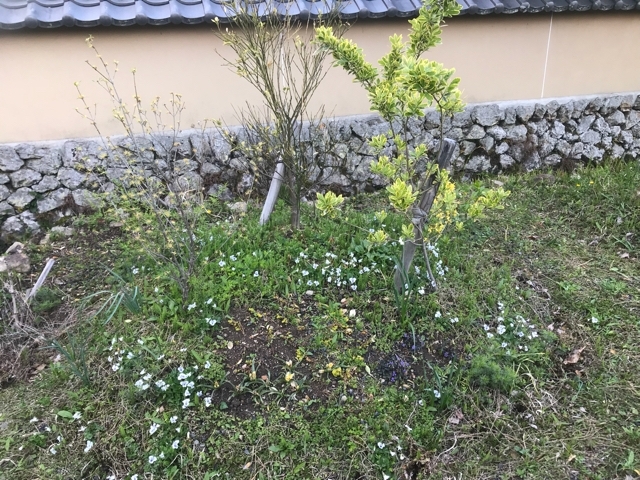 On this day, I played the circulation function mainly around pruning of plum and around laurel with attached soybean disease which seems to be caused by Bombyx mori. In the city, the place of about 30 cm is already a hard clay hard hard layer. Because there are many roots, it was impossible to work with big scoops, and cotonga and transplanting scoops were active. 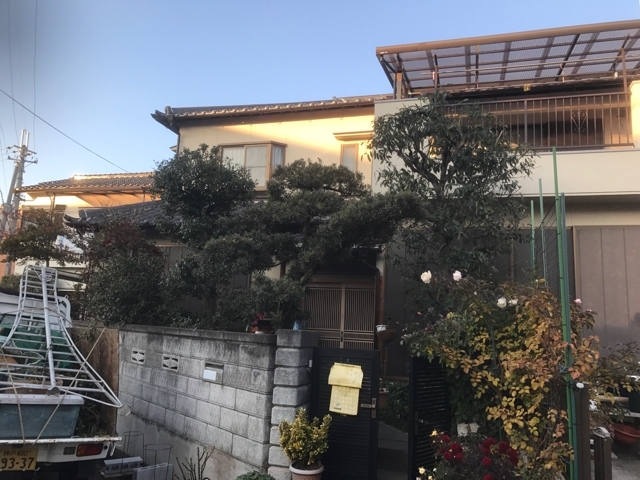 < > The owner also helped in the processing of pruned branches and so on, and pruned branches are to use as a material for future circulation maintenance, so the disposal branch is zero. I talked so much that I did not pack too many branches, I talked about various things so that I can work on my own. < > I think that you understand that the part that is invisible is more important than the visible part. 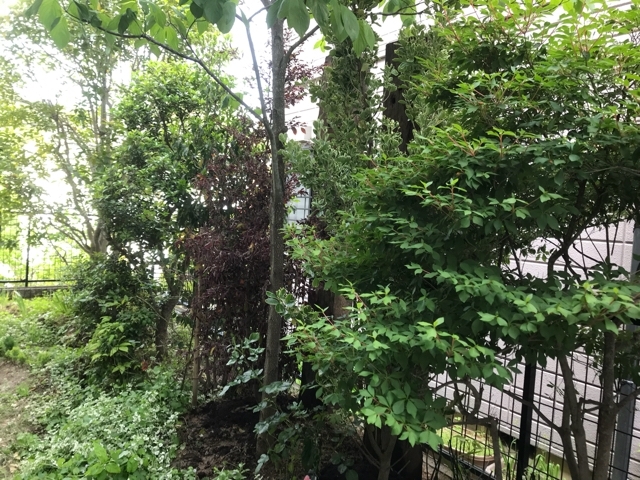 I think that it will become a garden of good woods if you extend the Takagi more freely. 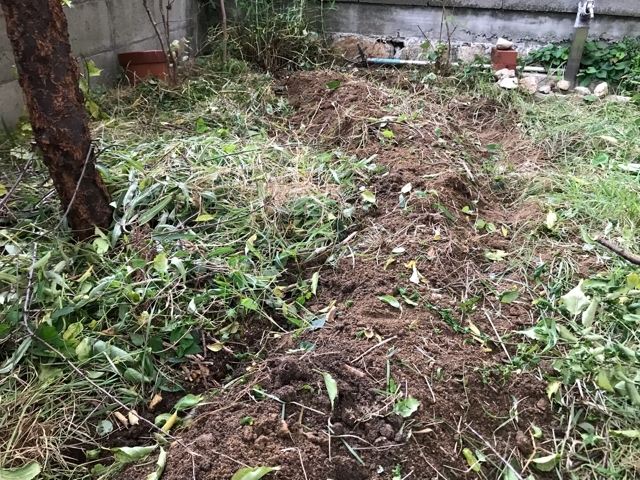 I would like to tell you how to use fallen leaves for mulching and how to utilize charcoal, helping microorganisms of earth and insects and other living things help you while maintaining a small garden that functions ecology . In autumn we will also ask for maintenance. < > It is the scene of Kyoto Prefecture Sonobe. 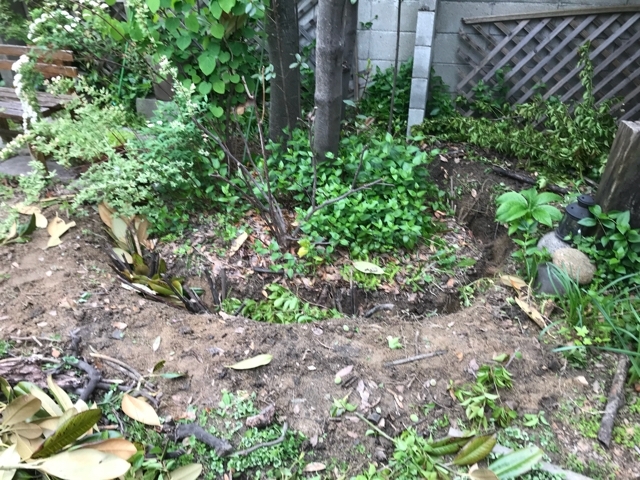 I asked maintenance on the scene where I made a garden. 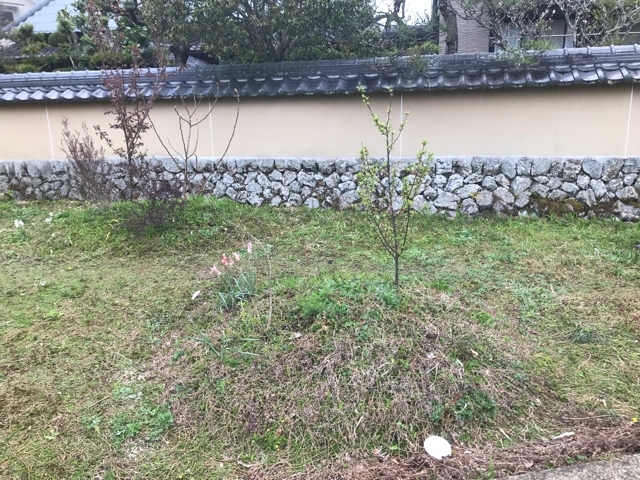 There were many branches due to this winter snowfall due to the fact that Yuz was somewhat sore and there was a branch due to the weight of the snow, but also the branches of Yuzu were extending and the branches broken trees also had less damage , Overall weeds also grow well, I feel familiar. What I consulted at the beginning of the visit was that it was hard for a lot of horsetails to grow and to get out. It is commonly found in acidic soils. It is connected with rhizomes so it will be difficult to cut off because it will have roots that have been torn. 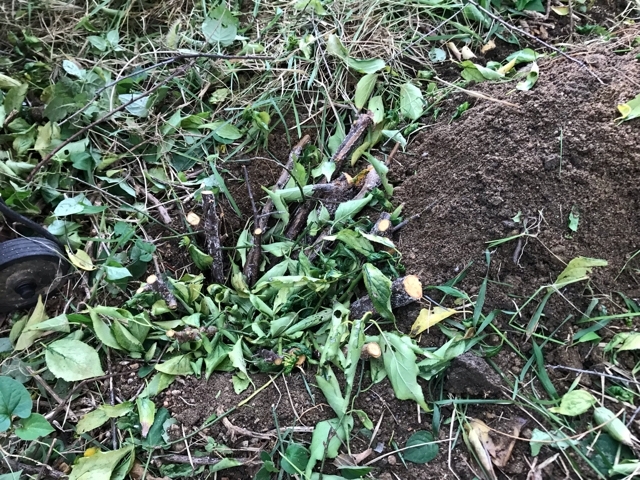 However, since it is alkaline when it dies, if grass clippings are merely mulched or left to remain until it dies, acidic soil gradually tends to neutral, and the horsetail itself declines. However, horsetail is very highly effective plants and has a detoxifying effect, and it is good for the body when you drink tea etc. every day. It can also be dried and stored. It may be good to put in a bath. 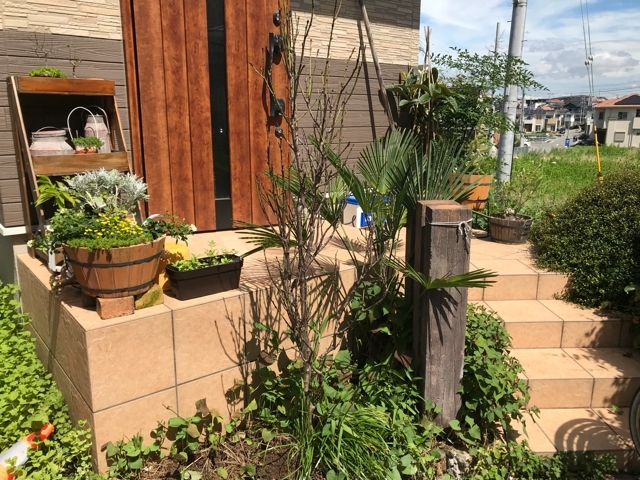 I think that herbs are also good for medicinal baths, but it can also be expected to have great effects such as horsetails and flower bouquets (before flowering), mugwort, loquat leaves. 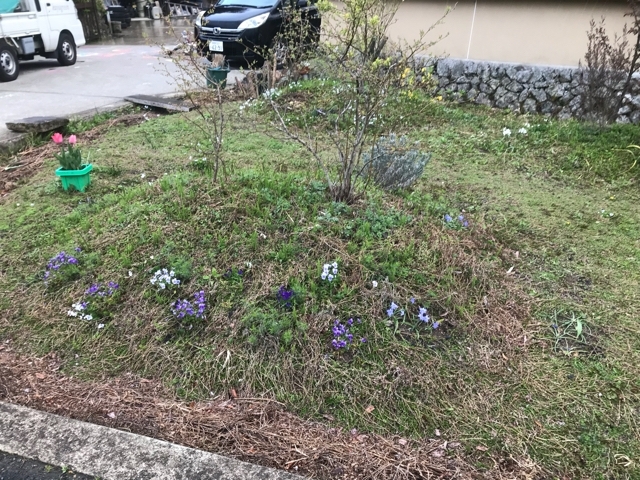 Since a lot of my hobbies were out there, I think that I could have some fun by making it a bit lower than the flowers. The fresh green of the horsetail was also beautiful. 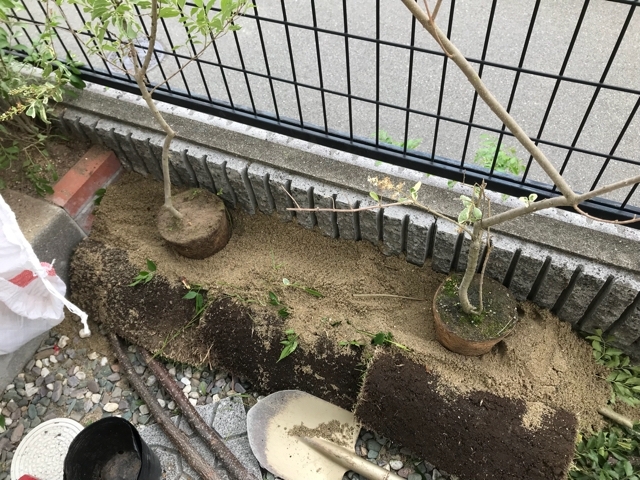 < > We make several Tsuyama, we are planting the main plant there. 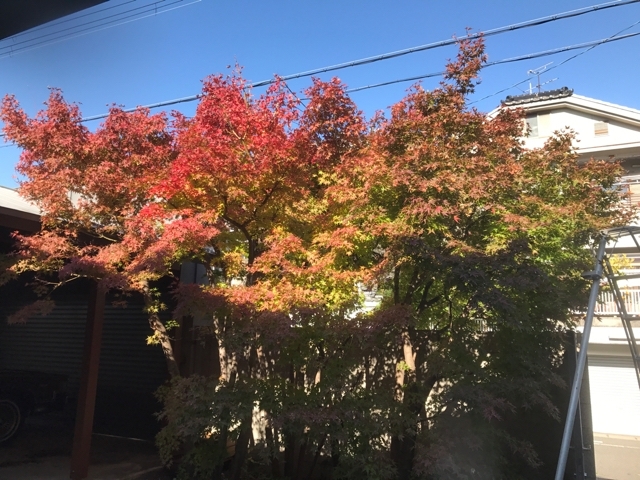 We divided colors for each of Tsukiyama and made it possible to enjoy the colors of yellow, red, blue, white and leaves and flowers. < > I put vent treatment grooves and vertical holes in the hem of Tsukiyama. It is to raise the stability of Tsuyama itself and the permeability of rain. < > Space is a place surrounded by roads and walls as a whole, but also deep sideways grooves and around 50 centimeters of vertical holes are also constructed around the space at key places. < > Water is popping from the vertical hole near the most sloping side in front. There is a side groove on the wall side, and the side groove function is fulfilled further from thing close to it. 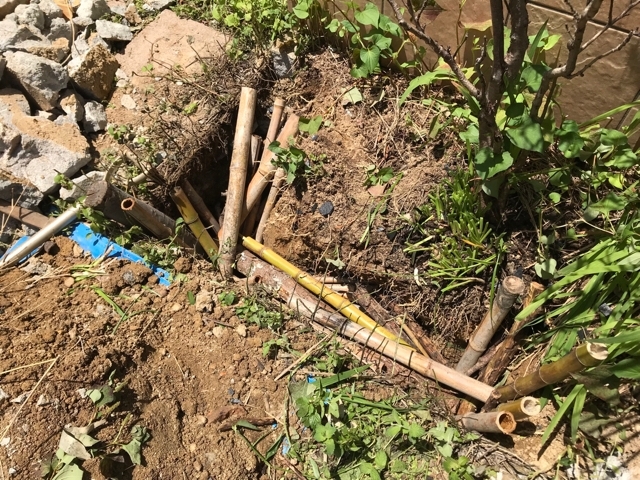 < > When there is a lot of spring water, such as on a rainy day, penetrating water from the entire garden turns around the space and travels through the permeate pipe of the open culvert, finally being discharged to existing side gutters. < > By allowing water and air to smoothly penetrate into the entire space and to have a function to circulate, it suppresses the generation of organic gas which is likely to occur in the stagnant soil, and also affects the surrounding circulation Become. It is said that there are quite a lot of dokudami, but the approach part can be suppressed by walking. 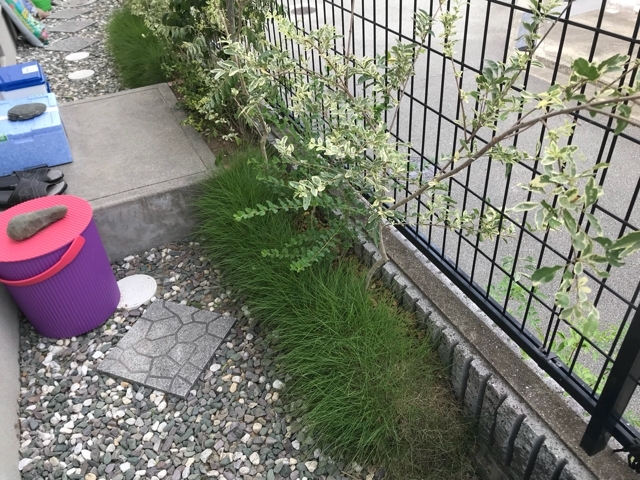 Since there are plenty of places in the vicinity of Tsukiyama, I think that the momentum of Dokudami can be suppressed if you plant vegetables and flowers. Ripia planted on the approach was well prosperous. I think that small white flowers will bloom from now on. Ripia is also a strong undergrowth for trampling, so we recommend it for approaches and so on. I heard that the kids are running around. Bamboo wood is put in the docking but it is not on the ground, so just be careful not to get stuck. Also I will regularly ask for maintenance. 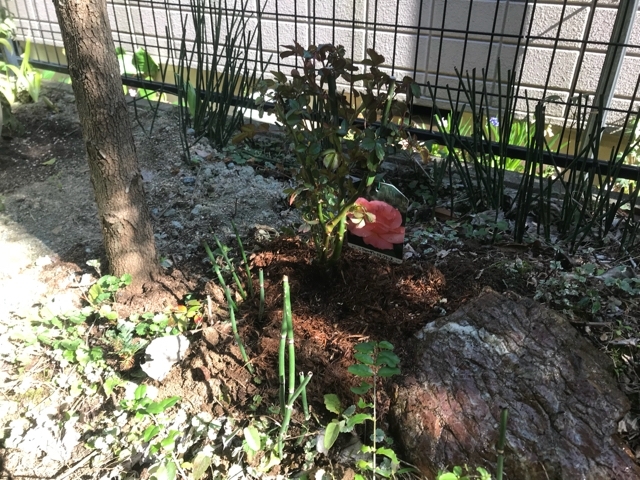 Previously, it was a scene where I made a big change of planting, but I got the request of a rose, I came to see the state after a long absence. Because we plant a lot of host plants in winter dead, this season is still less green. 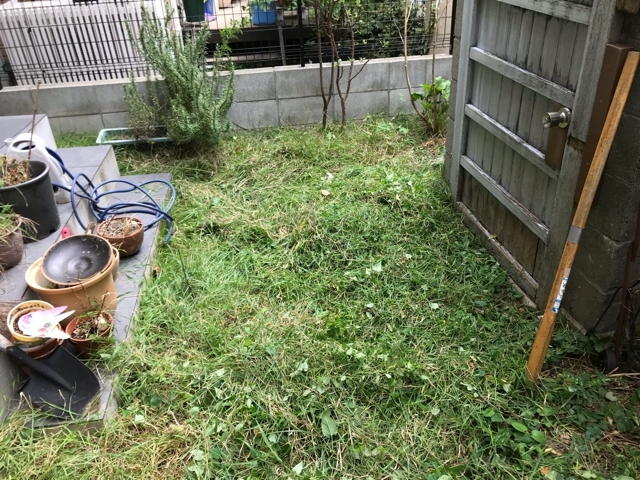 < > However, thanks to keeping fallen leaves and harvested grass in the planting space and making sure not to pull out the grass too much, soil became gradually better. < > Rose seedlings are Orange large wheat variety, summer dream and pink middle ring type, Jardin de France, both of which are four seasons bloom. < > Roses liked myself, and in the previous garden I brought up nine kinds. Also in this garden, we put 5 of this time and planted them. Roses are also various varieties, and many shops and books specialized in specialty are out. I think there are also impressions that it is difficult to raise, but if you choose a strong variety, it will not take so much time and effort. It grows well even in places with little planting space. Because the seasonal varieties add flowers one after the other in spring and autumn, they are very healed. 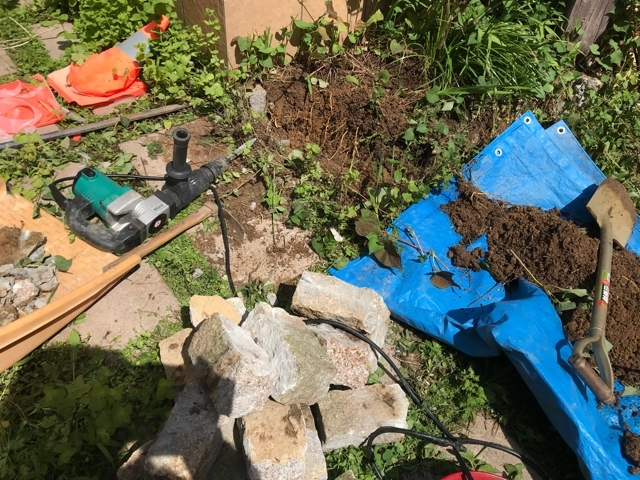 It is a garden surrounded by retaining walls as we are changing the planting and at the same time also undertaking maintenance of the underground environment, but the condition of the soil was considerably better. 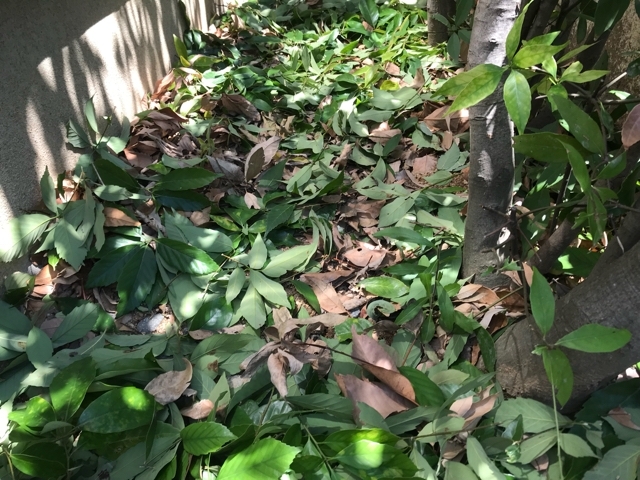 As well as the front yard, we are also refraining from grass cutting and fallen leaf cleaning. As rainwater permeability improves and organic matters are returned to the soil, microorganisms in the soil increase and it gets activated and garden trees and grass become healthier as well. This garden does not prune very much either. When the root's breathing becomes easier, the branches do not rampage and it will not stretch to any extent. 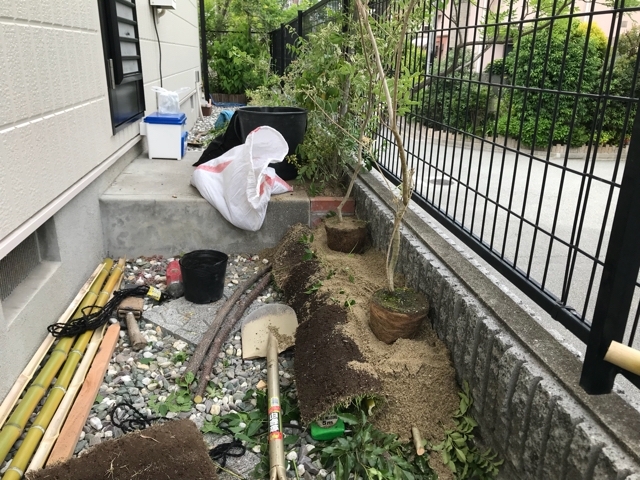 < > The soyogo tree planted by myself was a little deep planting, so I put 3/1 on the ground and made a shallow plantation. Sooyogo grows up greatly, so if you do not want to enlarge it, grow well even just leave it untouched. There are tricks on how to place it. Because it is a narrow garden, we can do a variety of ingenuity. We ordered additional blindfolded trees so we picked a nice feeling tree and I will call on you again. I wrote an article on the site last year and forgot to UP. 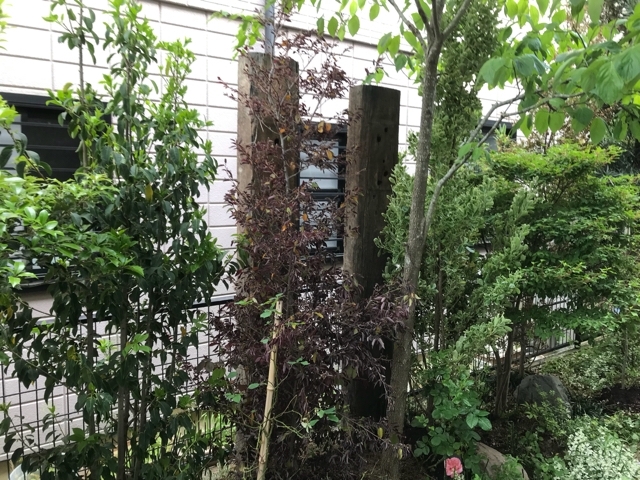 It is a small garden, but trees that are comparable to Japanese gardens are planted, such as oak and Ubameagashi, giant goat maca, holly, crispberry, ume, sasanqua, hydrangea. 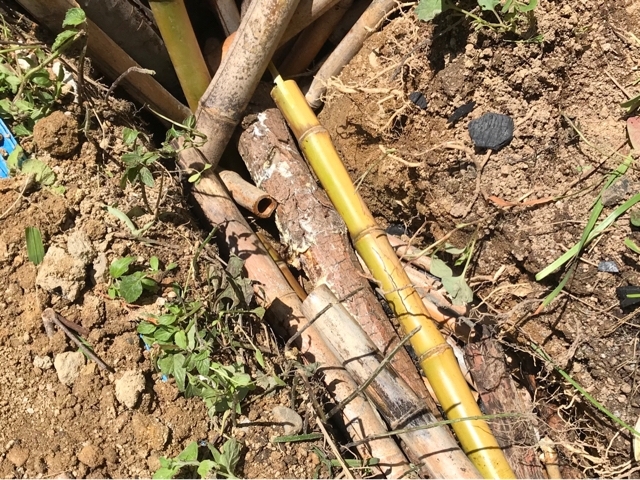 Incidentally, the water line is constructed with branches and charcoal without using pipes. Even after the damaged Maki revived it has been growing well. The Ubama grease which was the pruning has also returned to its natural form. The natural shape is the most beautiful. When it is in a natural form, it is lively and it is calm. 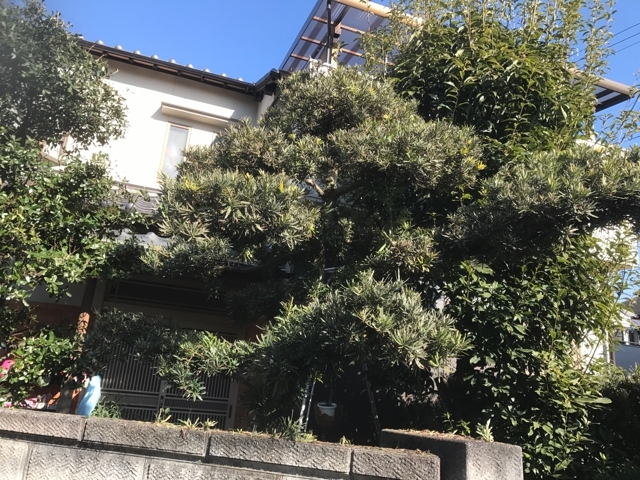 I think that the beauty of that figure of its natural form is more throbbing than oak because many Ubameagashi were growing in her parents house. personally. Recently, the branch is as "as possible" foldable as much as possible. When I was a child, I saw buds blowing from a broken branch becoming the next branch. I did not observe it, but since I see it every day I can see that I grow up. Buds will come out from the lower part and become the next branch. The tree produces a sound that makes you cry as you approach the metal. It is a feeling that I hate it because it is like a wave, like a boon. So, slowly bend the branch and fold it. The place where branches are broken is where cells are easy to separate. Like the place where the lizard's tail bursts, the place where the branch breaks is decided. By doing so, taking branches like taking off a joint, I feel that the burden on the soul of the tree will be considerably alleviated. I feel that the person touched by hand is more comfortable than the human body is touched with metal. I have the same feeling, plants as well. The soul also has plants properly, it feels painful or painful, and there are fate and happiness and misfortune. For example, if you become a wood sword and injure a person, that tree is a shura or hell. But, if you become a book or a letter and you can make someone happy, it is the realm of heavenly world, a voice message, and a morning sense. It is fun to work while thinking about such a thing. While working, I think it's fun, if it leads to my soul's growth, I feel that it is the best. Recently I think that there is a difference between work and everyday. For example, even if I dress it, I divided work clothes and private clothes, but if I did wear cotton clothes, I came to think of everyday when I worked with casual clothes (favorite clothes). Well, I do not get it, but it's getting longer so much. It is Kobe City Y Mansion. It is a garden like an oasis in downtown when entering inside. The wife of gardening love is being kept daily. 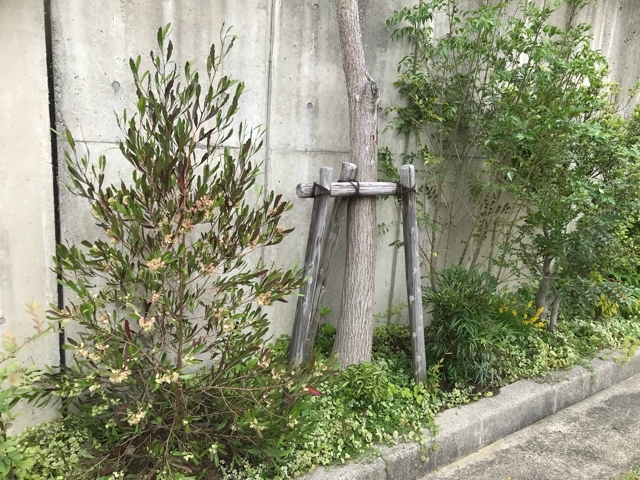 The hedge next to the gate is an oak tree. I will fold it with sawtooth at the place where fluffy branches are broken. Bakutsu. 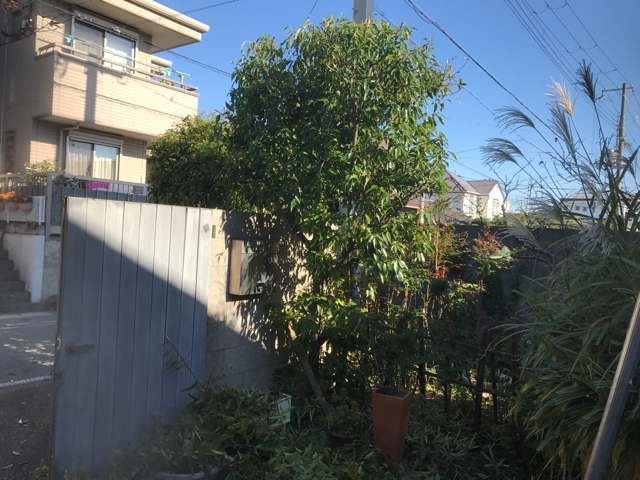 It is more pruned than branching. The thick branch is broken, and the thin branch is scraped off with a beaked mushroot or rhubarb. Why fold? Because the wind breaks branches. It surely breaks at the place where the wind breaks. So, the fine roots are easy to develop. The oak branches are easy to break and easy to understand. 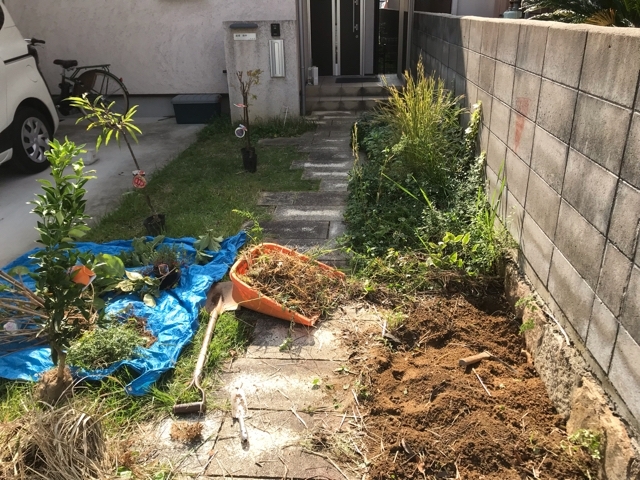 It was the oak tree that I pruned trees for the first time as my occupation. It is said to the boss who continued to clean up as "to tell that oak for the time being" to the master. The pruning of oak trees is the basic of the garden shop and individuality comes out, and it is also possible to erase individuality according to the way people and their workers work. An oak that felt a mission as an hedge. Just being alive has a role. The oak where I entered the gate. Hedge and facial expression also have different roles. But the roots are connected, exchange information and exchange necessary elements. 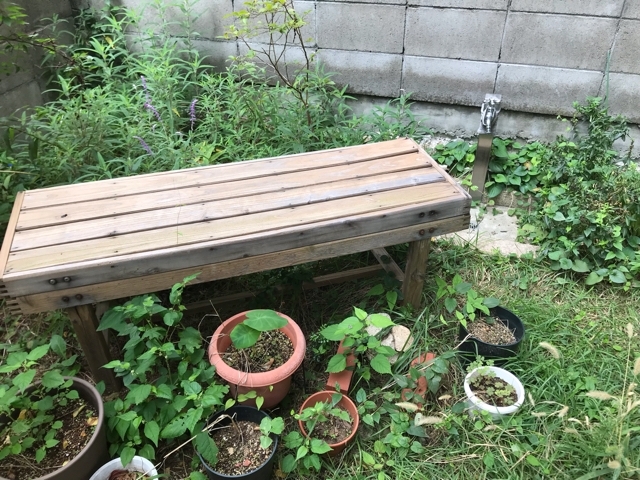 This garden is comfortable because there is a tree network. The network of the root. 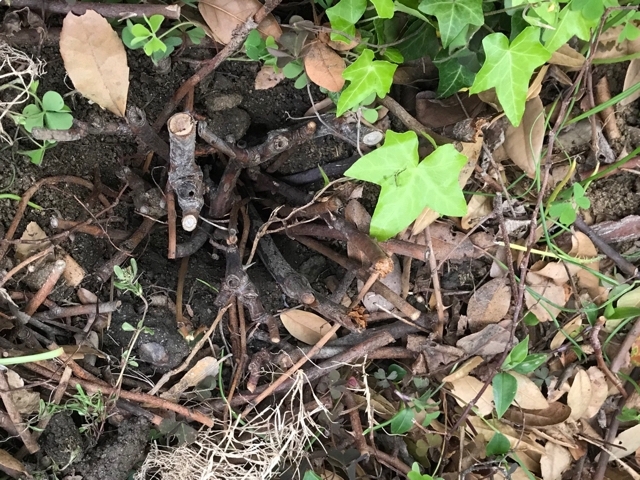 Roots are entangled in the whole garden and they are connected. 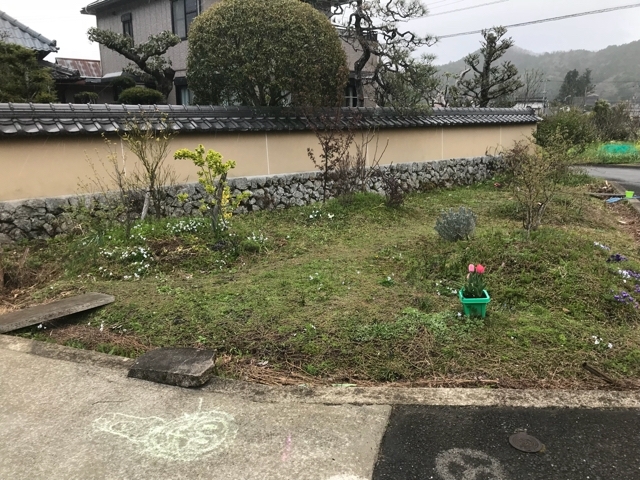 It is divided into a northern garden and a south garden, but there are networks of north garden and south garden, respectively. Autumn leaves in the northern garden. Because autumn leaves are a little sticky, it is difficult to break. 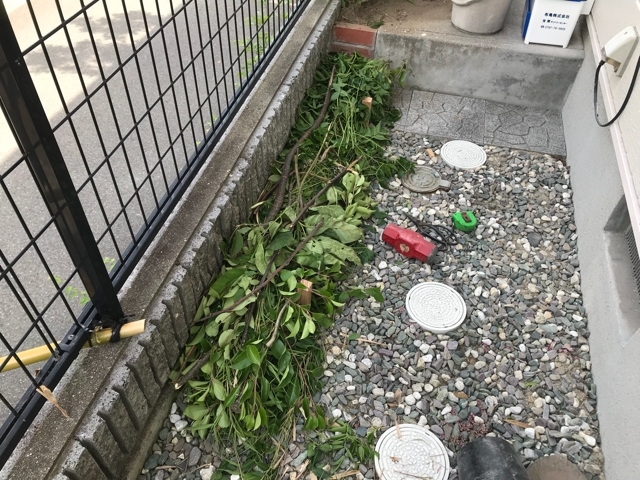 It is that it will become windy. So it is more windy than oak. But oak has deep roots, so I think that it will be suitable for a mansion forest. 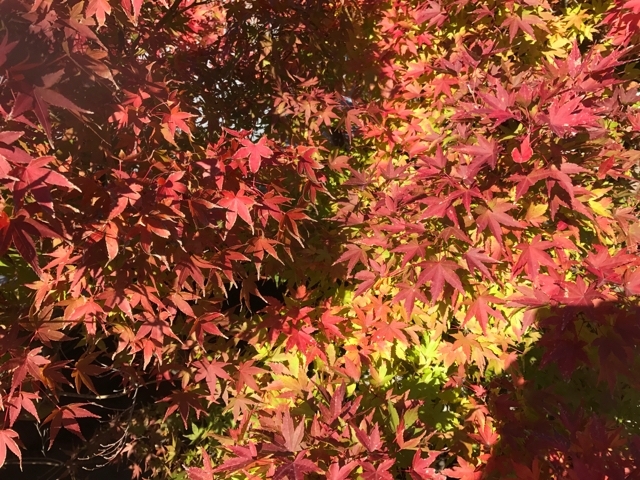 Autumn leaves are a favorite tree. 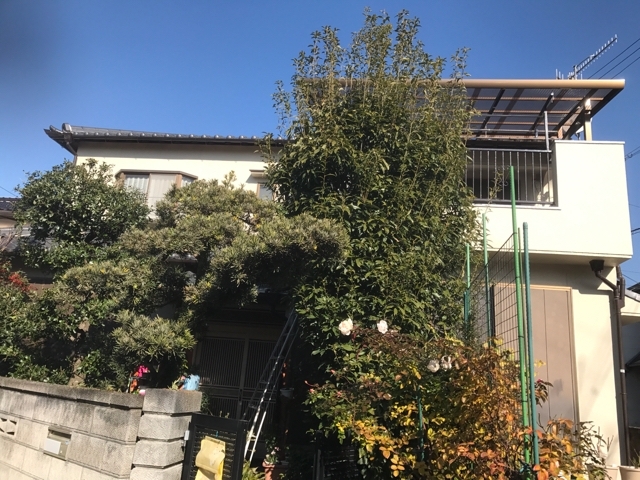 The autumn leaves are also beautiful, the sense of sheer leaves seen from the bottom of the summer is also beautiful, I like the autumn leaves in the summer. But autumn leaves which fell to the ground are also beautiful. I want the tree in my garden.